Have you ever experienced a poor university or university-type lecture situation where the lecturer simply gives a monologue, regurgitating information as you scramble to take notes? Instructional design is the opposite of this. As a result, instructional design makes e-learning courses successful. In fact, using instructional design techniques and concepts is often the difference between a professionally produced course and one created by someone who is not an e-learning professional. What exactly is instructional design in e-learning, however, how does it work, and what does it look like in practice? Instructional design is about designing e-learning courses in a way that makes learning easier, faster, and more effective. It focuses on helping people learn rather than simply giving them information they can then use to learn if they choose to and if they can. In other words, it is not just about presenting materials for people to learn. Instead, it is about presenting the learning materials and structuring the e-learning course to assist people in the learning process. This includes things like making the content relevant to the learner as well as helping them navigate through the content in a way that maximises results, particularly medium and long-term retention rates. So, instructional design is about making sense of the content in an e-learning course as much as it is about the content itself. As a result, an instructional designer should understand how people learn. An e-learning course developed using instructional design principles will focus on what the learner needs to do rather than what he/she needs to know. This shift in emphasis is subtle on the surface, but it creates much more powerful and effective e-learning courses based on good instructional design. In practical terms, e-learning courses based on good instructional design are rarely linear. This is because people don’t learn in a linear way. E-learning courses based on instructional design instead use techniques like scenarios, gamified elements, and learning techniques like spaced repetition to ensure learners fully grasp and can use the knowledge and skills they are learning. Research to analyse the needs, level of knowledge, and skill level of the learners who will go through the course. Often learners have varied levels of skill and knowledge, but it is vital this is known at the outset. Speaking directly with learners is usually the best way to complete this first stage. Identify the learning objectives and how results will be measured. This normally comes from senior management in the company. Develop training and educational strategies to deliver the most effective e-learning course and, ultimately, achieve the objectives. This is often done using storyboards, rapid prototyping, and other techniques. Develop the e-learning course including creating the media, writing the content, and designing the course technically. Meaningful images – real-world images that learners can relate to and/or learn from directly are much more effective than images that are in place for decorative purposes only. No distractions – part of good instructional design involves keeping learners focused. This means removing as many distractions as possible. Bite-size chunks of information – most people learn better in bite-size chunks where they understand one piece of knowledge, skill, or concept before moving onto the next. Relevant content – at every stage, the content should be as relevant to the individual learner as possible. It is important to remember that relevant to the organisation does not always mean relevant to the learner as individuals within an organisation can have very different experiences. Intelligent use of colours – the colours used should facilitate the learning process and not become overbearing or distracting. Content types – it is important to use multiple content types to keep learners interested and focused. Use learning by doing techniques – making learners as active in the learning process as possible helps achieve the best results. There are lots of ways of doing this including using gamification and social elements within the course. 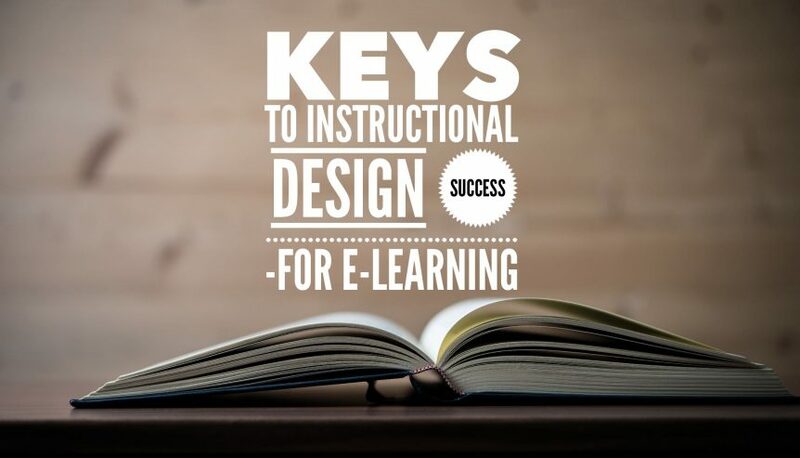 Instructional design is a process that delivers the best possible e-learning results. Focusing on the learner and doing everything possible to help them learn is central to its success.